According to a recent survey by the Centre for Addiction and Mental Health, 86 per cent of students in Ontario visit social media sites daily and about 16 per cent spend five hours a day or more on social media.5 For some people, high rates of SNS use can lead to compulsive behaviours with symptoms similar to addictions when SNS use is restricted or stopped.6 Despite the possible negative consequences of frequent SNS use for some, internet addiction is not officially recognized as a psychological disorder in the Diagnostic and Statistical Manual of Mental Disorders (a manual that provides diagnostic criteria for mental illnesses). However, some researchers have identified and acknowledged that patterns of continued use are “capable of altering the mood, motivation, concentration and producing a dissociating and disinhibiting experience for users.”7 For some people, frequent use of SNS can lead to patterns that can be compulsive and have negative impacts. Research also suggests that there are similar neurological responses between compulsive SNS use and addiction to substances. For example, by using MRI scans and monitoring activity in the nucleus accumbens (the reward centre of the brain), researchers examined how social media use affected the brain. They found that the reward centre of the brain was often more activated after receiving positive social media feedback, such as when their peers provided ‘likes’ on Facebook posts. One of the researchers, Dal Meshi, notes that “[a]s human beings, we evolved to care about our reputation. In today’s world, one way we are able to manage our reputation is by using social media websites.”8 The changes in the participants’ brains that resulted from positive feedback on an SNS site were similar to individuals who experience addiction to substances like drugs or alcohol. There are a wide range of risk factors for addiction, including age, peer pressure, relationships to family and/or community, and pre-existing mental health issues. As a result, it is important to view problematic behaviours, such as internet addiction or gambling, through a bio-psycho-social lens, which is similar to the way some view substance use-related addictions. This approach allows for an understanding that there is not one fixed reason for an addiction. Instead, addictions can be a result of a combination of biological, psychological and social factors that impact an individual’s behaviour. Often, there may be other reasons, such as low self-esteem, loneliness or depression, that may contribute to a person using the internet problematically. A bio-psycho-social perspective can provide a framework for understanding the many complex factors that could contribute to someone having a problematic relationship with SNS. Some researchers suggest that social networking platforms are a new form of communication and that society is still learning how to adapt. They suggest that there are similar concerns regarding problematic use of technology. For example, previously there were concerns about addiction with other forms of new technology, including television. 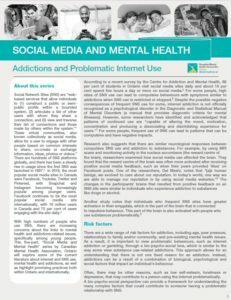 While there are concerns about a growing number of individuals who have problematic relationships to social media, there is also evidence to suggest that some social networking sites can have positive impacts for individuals who are seeking support for issues related to the internet/SNS and mental health and addiction. While researchers have identified that excessive use of online social networking may be particularly problematic to young people, there are promising practices that have emerged to provide both awareness, psycho-education and practical skills to adapt to SNS. One researcher suggests the role of psychoeducation to “teach people how to adapt to a new communication environment in a healthy and effective manner. Classes, seminars and public campaigns could be implemented in academic institutions and workplaces to teach people how they can optimally manage new communication channels and the risks that they may carry.”10 This suggestion would allow for broad conversations about the strengths, benefits, and potential issues with new forms of communication in an educational setting. In addition, the role of parents and caregivers is also an important consideration. Tools and resources, such as eMentalHealth.ca, are available to help parents have conversations with their children about internet consumption and ‘cyber mental health.’ It is not realistic for many, especially younger users, to completely abstain from technology. But balancing screen time with other aspects of life may mitigate some of the negative consequences of excessive SNS use. eMentalHealth.ca encourages families to ‘unplug’ by spending quality, tech-free time together, setting limits on technology, specifically around bedtimes and meal times, discussing ground rules for cell phones and having open discussions about social media and the role it plays in their lives. This evidence suggests that it is important to understand the underlying factors and motivations for why people may use SNS in problematic or excessive ways. SNS are platforms for communication that are now a way of life for many. 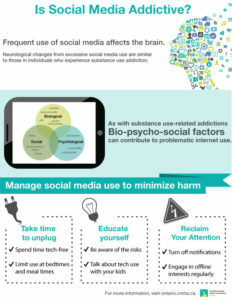 Explaining the phenomenon of problematic SNS use requires an examination of the user using a bio-psycho-social approach. This can help determine what motivates them or what reward or gratification they seek when using social networking sites. 2Naslund, J.A., Aschbrenner, K.A., Marsch, L.A., & Bartels, S.J. (2016). The future of mental health care: peer-to-peer support and social media. Epidemiology and Psychiatric Sciences, 1-10. 3Kuss, D & Griffiths, M. (2011). Online Social Networking Addiction – A review of the Psychological Literature. International Journal of Environmental Research and Public Health. 8:9. 7Carbonell, X & Panova, T. (2016). A Critical Consideration of Social Networking Sites` addiction potential. Addiction Research and Theory. 10 Carbonell, X & Panova, T. (2016). A Critical Consideration of Social Networking Sites` addiction potential. Addiction Research and Theory.